MILWAUKEE – In a move announced today that’s bound to have a negative impact on its dealers, Harley-Davidson has opened an online store with retail giant Amazon. 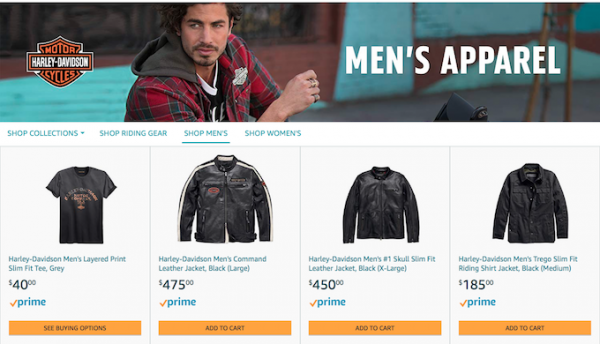 It’s offering “select Harley-Davidson apparel and riding gear.” Merchandise is available as of today, with two-day shipping for Amazon Prime members. Harley-Davidson expects to reach “hundreds of millions of potential customers” via Amazon, according to a company press release. “We live in an on-demand, anywhere, anytime business environment where success depends on the ability to meet consumers on their turf and on their terms, “said Heather Malenshek, Harley-Davidson’s senior vice president of marketing and brand. 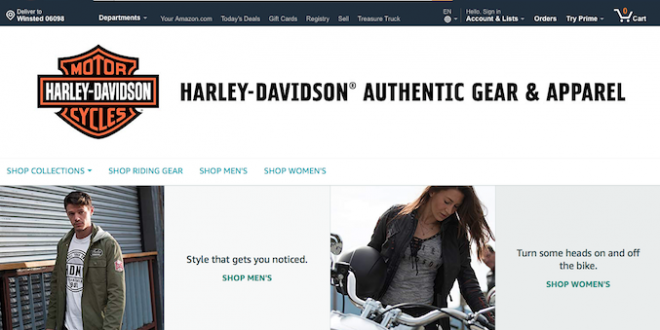 Harley-Davidson has aggressively marketed branded “motor clothes” for decades with accessory departments providing a crucial revenue for dealers, which are limited by the company to only selling obsolete gear online. Now, the company is taking a high-profile measure in going directly to consumers. “This is an exciting time in Harley-Davidson’s incredible history, and we have an opportunity on Amazon to showcase our brand, to grow reach, relevance, and access – and ultimately, the opportunity to bring new riders into our Harley-Davidson family,” said Malenshek. The “Journal Sentinel” newspaper in Milwaukee said dealers were notified of Harley-Davidson’s partnership with Amazon in a webinar. The company said online prices will be the same as those in dealership and that it will collect sales tax for online sales.